Berikut ini adalah tutorial instalasi Zimbra Suite Plus. Proses instalasi baik di Zimbra Open Source maupun Network Edition sama-sama seperti step berikut ini. Berikut adalah proses pada saat instalasi Zimbra Suite Plus. No preexistent Core installation found. No preexistent ZeXtras Migration Tool Zimlet installation found. No preexistent Zimbra Suite Plus Zimlet installation found. ZAL is released under the GNU General Public License version 2. Zimbra Suite Plus , and therefore must be downloaded from the ZAL website. is also available, "zxsuite" . 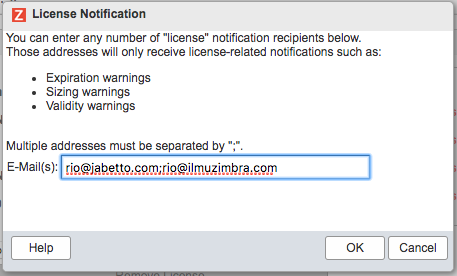 Run it as the zimbra user in order to see the available options. to operate, for inter-instance communication. in order to perform the installation. Zimbra Suite Plus Core installation successfully completed. * related zimlet to be installed in order to operate. Zimbra Suite Plus Core detected. INFO: Deploying Zimlet com_zextras_zextras in LDAP. INFO: Installing Zimlet com_zextras_zextras on this host. The Zimbra Suite Plus Zimlet has been successfully installed. it's highly suggested to clear both your browser's and server's cache. Untuk melakukan aktivasi license, masuk ke menu Home – Zimbra Suite Plus – Core. Klik tombol Choose File, lalu pilih license yang sudah didapat dari Zimbra. Masukkan email untuk license notification seperti Expiration, sizing dan validity warnings. Jika sudah, maka license akan terlihat seperti berikut.